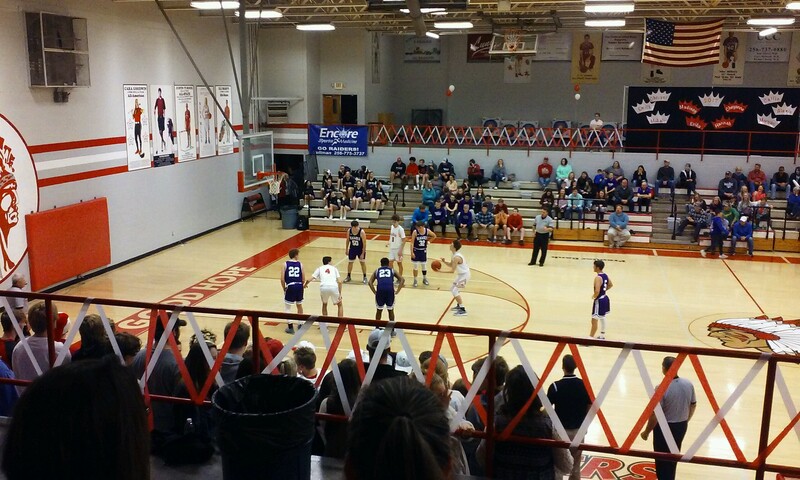 GOOD HOPE – Tuesday was homecoming night for Good Hope as the Raiders hosted Danville. During the homecoming festivities, Madison Creel was crowned Homecoming Queen. With Good Hope trailing 5-4 with a little less than five minutes to go in the opening quarter, Kallen Sharpton got called for a travel, and sprained his right ankle on the play. He did not return for the rest of the game. Both teams got sloppy with turnovers and missed shots for most of the first quarter. After a Landyn Freeman layup gave the Raiders an 11-10 lead, it was all Danville after that, as the Hawks finished on a 9-0 run, taking a 19-11 lead after one. The second quarter was a different story, with the Raiders getting off to a really strong start on both sides. The Maddox brothers, Cole and Drew, got things started with layups to cut it to 20-15, then after a Preston Shelton layup by Danville, Isaac McDonald got red hot, scoring six in a row, cutting the deficit to just one at 22-21. After a Shelton free throw, Cole Maddox hit 1-of-2 from the line, while a Drew Maddox three gave the Raiders a 25-23 lead with 2:48 remaining in the first half. McDonald added another layup to make it 27-23 at the half. A Garrett Robinson layup, followed by five quick points by Cameron Orr, jump-started Danville's offense in the second half, and that gave them a 30-27 lead, but Drew Maddox answered with a trey from the right wing to tie it at 30 with 4:31 remaining in the third quarter. Both teams traded baskets and turnovers over the next several possessions. After an Adston Compton layup tied it at 38 for Danville, the Raiders finished the quarter strong on a 6-0 run, including a Freeman putback just before the buzzer sounded, to take a 44-38 lead after three. A Cole Maddox three made it 47-38 to start off the final quarter. Robinson scored four straight points to make it a 47-42 game, then McDonald answered with four straight to push Good Hope's lead to 51-42, then five straight points by Jayden Legg, including a three, cut the Raider lead to 51-47. Good Hope did not let Danville get any closer, as Cole Maddox, McDonald and Matt Dixon helped finish off the Hawks by way of a game-ending 12-4 run to take it at the end. McDonald finished with a game-high 26 points for Good Hope, and Cole Maddox was not far behind with 21. Drew Maddox ended up with eight. Freeman finished with five. Sharpton had two before the injury, and Dixon ended up with one. The Raiders improve to 5-4 on the season. Sharpton's status for Thursday's game against Holly Pond is TBD. Good Hope looked for a sweep in the girls' game against the Lady Hawks. Danville, though, had other plans as a three each by Emma Broadfoot and Jolee Cole gave the Lady Hawks a 6-1 lead. Another Broadfoot three gave them a 9-3 lead, but Good Hope looked to stay close, as an Abby Neighbors layup, followed by a Leyton Seal three, cut the deficit to just one at 9-8. Broadfoot was just too much for the Lady Raiders, though, nailing two more from behind the arc to help her team finish on a 9-0 run to take an 18-8 lead after one. A layup by Kate Kent, then an Erika Woodall three from the left corner, made it an 18-13 game. But every time Good Hope made a run to get back in the game, Danville stopped the Lady Raiders in their tracks. A quick 10-0 run turned into a 28-13 lead, and Good Hope couldn't get the deficit under double digits before the half, heading into the locker room trailing, 33-20. That play continued into the second half, as the Lady Hawks answered almost every Good Hope field goal with one of their own; the score was 48-30 after three. Despite their best efforts, the Lady Raiders fell short at the end. Kent finished with a double-double: 10 points and 11 rebounds. Seal had eight points, seven rebounds and three steals. Woodall also finished with eight points in the game, as did Savanna Derrick, who also added a pair of steals. Neighbors had four points and five rebounds, and Rudi Derrick added a three in the game. The Lady Raiders fall to 3-7 on the season, and will look to rebound on Thursday against Holly Pond at 6:45 p.m.